Monitors 4 holding tanks (Fresh, Grey, Galley and Black) like the 709-4 and adds a water pump switch and a water heater switch. 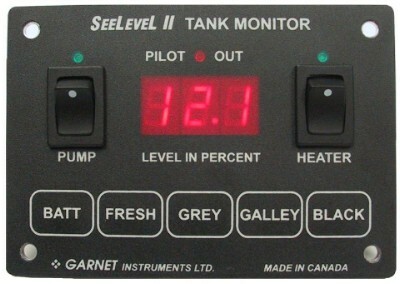 Calibrate LPG at first fill of tank or it can be factory calibrated. Display shows increasing level as resistance increases. Display requires 12 volts from the RV battery, the system will function from 11 volts to 16 volts. Current drain is less than 200mA.